Financial Services Institutions (FSIs) are more concerned than ever about risk and compliance management. Between several recent criminal and civil enforcement actions, increased government scrutiny, a growing set of rules and regulations, and a wealth of new financial services products and offerings, very few FSI professionals feels like experts in the field. Compliance is an area of expertise that has never been in greater need. Adding to this, organizations must have comprehensive programs in place to address their risks, including non-compliance with state, federal and international laws, regulations, conditions of participation and internal policies. 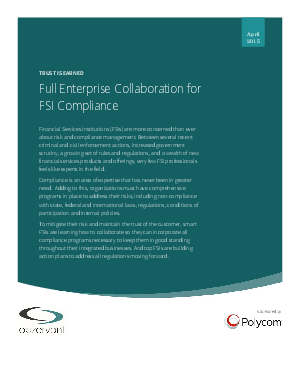 To mitigate their risk and maintain the trust of the customer, smart FSIs are learning how to collaborate so they can incorporate all compliance programs necessary to keep them in good standing throughout their integrated businesses. And top FSIs are building action plans to address all regulations moving forward.